Milk glass is a term that was originally used to describe opaque white glassware. It has since become used to include several colours of opaque and translucent glass, including white, blue, green, pink, black, yellow and brown. The origins of Milk glass begin in Venice in the 16th Century, when it was then known as "Opal" glass. This section of our encyclopedia focuses on pressed Milk glass produced during the Victorian era and later, by British manufacturers Sowerby, Davidson and Greener, French makers Vallerysthal and Portieux, and USA companies such as Westmoreland and Fenton. Sowerby Victorian blue milk glass basket bowl with peacock manufacturing mark and design lozenge. Pattern number 1157 1/2. Sowerby Victorian blue milk glass basket bowl, unmarked. Pattern number 1102. Sowerby Victorian white milk glass basket bowl with peacock manufacturing mark and design lozenge. Pattern number 1157 1/2. Sowerby Victorian white milk glass basket bowl, unmarked. Pattern number 1102. Sowerby Victorian blue milk glass basket bowl with peacock manufacturing mark and design lozenge. Pattern number 1182 1/2. Sowerby Victorian blue milk glass basket bowl, unmarked. Pattern number 1157. Sowerby Victorian black milk glass basket bowl, unmarked. Pattern number 1102. Sowerby Victorian blue milk glass basket spill vase with peacock manufacturing mark and design lozenge. Pattern number 1173. Sowerby Victorian white milk glass spill vase, unmarked. Pattern number 1102. Victorian blue milk glass basket bowl, unmarked. Victorian white milk glass basket bowl, unmarked. Victorian white milk glass basket bowl, unmarked. Sowerby Victorian white milk glass basket bowl, unmarked. Pattern number 1174. Victorian blue milk glass 'Cherubs' creamer / jug, unmarked. Manufacturer unknown. I am advised that this design is of the drunken Silenus, the mentor of Dionysus, god of wine. Victorian black milk glass 'Cherubs' creamer / jug, unmarked. Manufacturer unknown. I am advised that this design is of the drunken Silenus, the mentor of Dionysus, god of wine. White milk glass 'Louis XV' creamer/jug, by Portieux, pattern number 7349, shown in 1933 catalogue. Ref: The Milk Glass Book p141 + 213. Blue milk glass 'Louis XV' creamer/jug, by Portieux, pattern number 7349, shown in 1933 catalogue. Ref: The Milk Glass Book p141 + 213. Blue milk glass tankard / jug, unmarked. Manufacturer unknown. Blue milk glass creamer / jug, unmarked. Manufacturer unknown. Victorian black milk glass creamer / jug, unmarked. Manufacturer unknown. Victorian white milk glass creamer / jug, unmarked. Manufacturer unknown. Victorian black milk glass creamer / jug, unmarked. Manufacturer unknown. Victorian black milk glass creamer / jug, unmarked. Manufacturer unknown. White milk glass tankard / jug, unmarked. Manufacturer unknown. Black milk glass tankard / jug, unmarked. Manufacturer unknown. Fenton white milk glass 'Hobnail' creamer / jug, unmarked. Victorian black milk glass creamer / jug, unmarked. Probably by Davidson. Victorian black milk glass bowl, unmarked. Probably by Davidson. Victorian black milk glass bowl, unmarked. Probably by Davidson. White milk glass bowl, unmarked. Manufacturer unknown. Black milk glass bowl, unmarked. Manufacturer unknown. Blue milk glass bowl, unmarked. Manufacturer unknown. Victorian white milk glass bowl, unmarked. Manufacturer unknown. Victorian blue milk glass bowl, unmarked. Manufacturer unknown. White milk glass 'Top Hat' bowl, unmarked. Manufacturer unknown. Victorian blue milk glass bowl, unmarked. Manufacturer unknown. Victorian black milk glass bowl, unmarked. Manufacturer unknown. Victorian black milk glass bowl, unmarked. Manufacturer unknown. Fenton white milk glass 'Hobnail' bowl, unmarked. Victorian black milk glass bowl, unmarked. Manufacturer unknown. Blue milk glass bowl, unmarked. Manufacturer unknown. Blue milk glass bowl, unmarked. Manufacturer unknown. Victorian blue milk glass bowl, unmarked. Probably by Sowerby. Blue milk glass bowl, unmarked. Manufacturer unknown. White milk glass bowl, unmarked. Manufacturer unknown. Blue milk glass decanter, unmarked. Manufacturer unknown. Blue milk glass decanter, unmarked. Manufacturer unknown. Blue milk glass decanter, made in Portugal and sold by designer outlet Casa Pupo in London. Blue milk glass decanter + goblets set, made in Portugal and sold by designer outlet Casa Pupo in London. Blue milk glass goblet, made in Portugal and sold by designer outlet Casa Pupo in London. White milk glass goblet, made in Portugal and sold by designer outlet Casa Pupo in London. Blue milk glass beaker, made in Portugal and sold by designer outlet Casa Pupo in London. Blue milk glass beaker, made in Portugal and sold by designer outlet Casa Pupo in London. White milk glass beaker, made in Portugal and sold by designer outlet Casa Pupo in London. Blue milk glass goblet, unmarked. Manufacturer unknown. Blue milk glass goblet, unmarked. Manufacturer unknown. 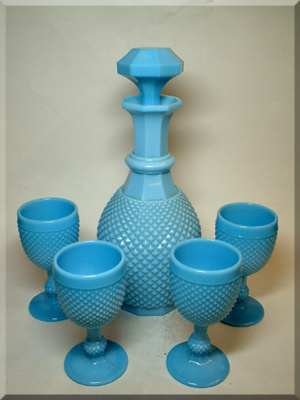 Blue milk glass goblet, made in Portugal and sold by designer outlet Casa Pupo in London. Blue milk glass goblet, unmarked. Manufacturer unknown. Blue milk glass goblet by Stiver, Colle val d'Elsa, Italy. Ref: click here Blue milk glass goblet by Stiver, Colle val d'Elsa, Italy. Ref: click here Blue milk glass goblet, unmarked. Manufacturer unknown. Possibly Italian c 1970's. White milk glass goblet, unmarked. Manufacturer unknown. Ref: click here Blue milk glass goblet, unmarked. Manufacturer unknown. Victorian blue milk glass toothpick holder or egg cup, by Vallerysthal / Portieux. Shown in Vallerysthal 1908 catalogue, pattern number 3994, and Portieux 1933 catalogue, pattern number 7198. Ref: The Milk Glass Book p211 + 213. Sowerby Victorian white milk glass vase or toothpick holder with manufacturing design lozenge. Pattern number 1154 1/2. Green milk glass matchstick or toothpick holder, marked "S V" to base. Manufacturer unknown, possibly French. Sowerby Victorian blue milk glass vase or toothpick holder, unmarked. Pattern number 1154 1/2. Victorian blue milk glass vase or toothpick holder, unmarked. Probably by Sowerby. Victorian black milk glass vase or toothpick holder, unmarked. Victorian black milk glass vase or toothpick holder, unmarked. Davidson Victorian black milk glass vase or toothpick holder, unmarked. Pattern number 166? Victorian black milk glass vase or toothpick holder, unmarked. Victorian black milk glass vase or toothpick holder, unmarked. White milk glass vase, unmarked. Manufacturer unknown. Sowerby Victorian black milk glass vase or toothpick holder with peacock manufacturing mark and design lozenge. Pattern number 1160. Victorian black milk glass vase or toothpick holder, unmarked. Sowerby Victorian black milk glass vase or toothpick holder with peacock manufacturing mark and design lozenge. Pattern number 1154 1/2. French blue milk glass vase, unmarked. Probably by Vallerysthal / Portieux. French blue milk glass vase, unmarked. Probably by Vallerysthal / Portieux. French blue milk glass vase, unmarked. Probably by Vallerysthal / Portieux. French blue milk glass vase, unmarked. Probably by Vallerysthal / Portieux. French blue milk glass vase, unmarked. Probably by Vallerysthal / Portieux. Blue milk glass vase, unmarked. Manufacturer unknown. French blue milk glass vase, unmarked. Probably by Vallerysthal / Portieux. French blue milk glass vases, unmarked. Probably by Vallerysthal / Portieux. French blue milk glass vases, unmarked. Probably by Vallerysthal / Portieux. French cream milk glass vases, unmarked. Probably by Vallerysthal / Portieux. Blue milk glass vase, unmarked. Manufacturer unknown. French blue milk glass vases, unmarked. Probably by Vallerysthal / Portieux. French blue milk glass vase, unmarked. Probably by Vallerysthal / Portieux. Blue milk glass 'Sujets' (figurals) vase, by Portieux, pattern number 7838, shown in 1933 catalogue. Ref: The Milk Glass Book p214. French blue milk glass vase, unmarked. Probably by Vallerysthal / Portieux. Blue milk glass vase, unmarked. Manufacturer unknown. French blue milk glass vase, unmarked. Probably by Vallerysthal / Portieux. Blue milk glass vase, probably by Vallerysthal / Portieux. Marked to base "JL & S", which is most likely Jules Lang & Sons (British importer). French green milk glass vase, unmarked. Probably by Vallerysthal / Portieux. Sowerby Victorian black milk glass vase, unmarked. Pattern number 1169. Victorian blue milk glass covered dish, by Vallerysthal. pattern number 3732. Ref: 1908 catalogue p303. Blue milk glass 'Hobnail' covered dish, probably by Fenton, USA. Blue milk glass 'Hobnail' covered dish, probably by Fenton, USA. Victorian blue milk glass 'Grape Vine' covered dish, by Portieux, pattern number 6655, shown in 1933 catalogue. This design was later reproduced by Jeannette Glass Co and Indiana Glass. Ref: The Milk Glass Book p212. Blue milk glass covered sauce pot, unmarked. Manufacturer unknown. White milk glass covered sauce pot, unmarked. Manufacturer unknown. Victorian blue milk glass toothpick holder or egg cup, by Vallerysthal / Portieux. Shown in Vallerysthal 1908 catalogue, pattern number 3828, and Portieux 1933 catalogue, pattern number 6708. Ref: The Milk Glass Book p210 + 213. White milk glass covered dish, by Westmoreland Glass, USA. Pair of black milk glass candlesticks, manufacturer unknown. Blue milk glass covered dish, manufacturer unknown. Large Victorian white milk glass 'Hen' covered dish, manufacturer unknown. Pair of blue milk glass candlesticks, manufacturer unknown. Blue milk glass 'hobnail' perfume bottle or decanter, manufacturer unknown. Victorian black milk glass 'Lion' ornament, by John Derbyshire. unmarked. Sowerby Victorian white milk glass basket weave plate, unmarked. Victorian blue milk glass basket bowl, unmarked.